[Updated at 11:18 p.m. ET] Aimee Seaver, the mother of a first-grade girl at Sandy Hook and a fifth-grader who attends a different school, told CNN's Anderson Cooper that her children are having trouble dealing with what happened. "It's a very rough night here," she said. "When your first-grader goes to bed and says, 'Mommy, is anyone from my class last year - are they all OK?' and you look at them and say, 'I'm not really sure,' it's a rough night to tell that to your 7-year-old." Her younger daughter has asked a lot of questions about Principal Dawn Lafferty Hochsprung, who was killed. “She got wind very quickly that something was wrong with our principal, which we didn’t tell her till just now that yes, she was definitely hurt and it wasn’t good," Seaver said. "It’s taking her a while. I think tomorrow will probably be harder for her. “I also have a fifth-grader who came off the bus crying because she … had a sister who she was worried about, and … just basically left that school a few months ago. I think for a lot of those kids, they kind of are a little older and can get it a little bit faster, even though they weren’t in it. [Updated at 10:50 p.m. ET] Janet Vollmer, a kindergarten teacher at the school, says she locked her classroom doors and - to keep her students calm - read them a story until the police came. Vollmer, her 19 students and the adult helpers in her classroom were not injured. She said the children knew something unusual was going on. When asked how she kept cool, she said: “With 5-year-olds, you can’t lose it. I’ve been doing this for a long time, it’s my 18th year of teaching. My job was to keep them safe." [Updated at 8:58 p.m. ET] Denise Correia says her daughter, a Sandy Hook Elementary second-grader who was not injured, heard the gunshots from the classroom she was in. The girl, while talking about the shooting with Correia, has been mentioning slain principal Dawn Lafferty Hochsprung "quite a lot." "I think everyone's coping as best as they possibly can," Correia told CNN's Anderson Cooper. "I'm letting her talk. She's mentioned quite a bit about the principal, who many of us have worked with. I adored her. I worked with her personally with my business. That is one person I know we have lost on a personal level." Correia said she has heard that her daughter's teacher, when the gunfire started, grabbed two kids from the hallway, put them into her classroom with other students, locked the door and gathered the students to a side of the room away from the gunfire. "She did a very heroic thing," Correia said of the teacher. "The kids are going to suffer from this," Correia said. "... We lost a lot of babies today in this town, and there are a lot of very sad families." [Updated at 8:20 p.m. ET] One injured victim, a female employee of the school, is "doing well," Connecticut State Police Lt. J. Paul Vance said. [Updated at 7:53 p.m. ET] The public release of the victims' names may come on Saturday morning, Connecticut State Police Lt. J. Paul Vance says. Vance said investigators have made preliminary identifications of the bodies, and that they've notified the appropriate families. But investigators want to make final, positive identifications before releasing the names to the media. "It's a horrific scene," Vance said. "Between our mutual experience, we've never seen anything like this." Vance said the next briefing from state police would be at 8 a.m. ET Saturday. [Updated at 7:48 p.m. ET] U.S. Rep. Rosa DeLauro, D-Connecticut, says her thoughts and prayers are with the families. "This really hits close to home," said DeLauro, who said she is visiting her grandchildren in Washington, D.C. "These beautiful young angels who had so much to live for - and it seems so senseless. Unthinkable that this could happen ,but it has, and now, as the president said, we come together, we wrap our arms around these families and hold them close to our hearts." [Updated at 7:10 p.m. ET] Cardinal Timothy Dolan of New York, president of the U.S. Conference of Catholic Bishops, offered his prayers for the families of those affected by the Connecticut shooting, according to a release from the group. The shooting "wrenches the hearts of all people," he said. 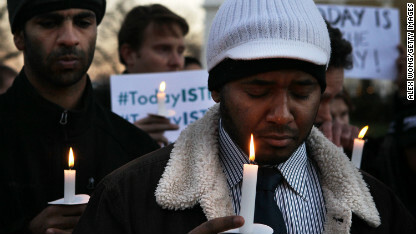 Faisal Ali, right, of Colorado Springs, Colorado, joins other people outside the White House in Washington, D.C., to participate in a vigil to remember the Connecticut school shooting on Friday. [Updated at 6:51 p.m. ET] A law enforcement official familiar with the investigation says the three guns found at the shooting site were legally purchased by Nancy Lanza, the mother of the suspect in the shooting. According to the law enforcement official, the Glock and Sig Sauer handguns were found inside the school with the deceased gunman. The Bushmaster was found in a car outside the school. The official did not know if the car was registered to the gunman, to his mother or to someone else. The official echoed what other law enforcement officials have told CNN: That Adam Lanza was the suspected gunman, and that he died at the scene of an apparent self-inflicted gunshot. [Updated at 6:44 p.m. ET] Three U.S. law enforcement officials, from different agencies, separately tonight identified the suspected shooter as Adam Lanza, contrary to what investigators had said previously. It is not clear what caused the confusion among investigators. His older brother, Ryan, was taken into custody for general questioning from a home in Hoboken, New Jersey. Officials did not label Ryan Lanza as a suspect. It is unclear when he may be released. One of the officials say Adam’s father was also taken in for similar questioning. There is no indication that the father will be charged. The official noted the father has remarried and lives with his new wife in a residence in the general area of Connecticut not too far from where his ex-wife lived. [Updated at 6:43 p.m. ET] CNN’s Susan Candiotti is talking to investigators at the scene as they piece together exactly what happened and when. She says she’s learned that the mother of the suspected shooter, Nancy Lanza, was found dead in the suspect’s home in Newtown. [Updated at 6:02 p.m. ET] "Evil visited this community today," Connecticut Gov. Dan Malloy just told reporters in Newtown. "And it's too early to speak of recovery, but each parent, each sibling, each member of the family has to understand that Connecticut - we're all in this together. "We'll do whatever we can to overcome this event. We will get through it. But this is a terrible time for this community and these families." [Updated at 5:14 p.m. ET] The mother of the suspected shooter was found dead in her son's residence in Newtown, a law enforcement source with detailed knowledge of the investigation told CNN. CNN had previously identified the mother as Nancy Lanza, a teacher at the Sandy Hook Elementary, according to law enforcement sources. The source also told CNN there was no body found in the house searched by authorities in Hoboken, New Jersey. Two law enforcement sources say a man was taken away from questioning from that house. He is believed to be the brother of the shooter, according to the sources. The first law enforcement source says the school shooter was dressed in "black battle fatigues and a military vest." The Bushmaster .223 found at the scene is a semi automatic weapon, the source says. Two other weapons found were handguns, a Sig-Sauer and a Glock. [Updated at 5:10 p.m. ET] We just learned that Governor Dannel P. Malloy will be speaking at Treadwell Park in Newtown, Connecticut, at 6:00 p.m. ET. "School shootings are always incomprehensible and horrific tragedies. But words fail to describe today's heartbreaking and savage attack at Sandy Hook Elementary School. As the father of two children in elementary school, I can barely imagine the anguish and losses suffered today by the Newtown community. "Our hearts and prayers go out to every parent, child, teacher, staff member, and administrator at Sandy Hook and the surrounding community. And our thanks go out to every teacher, staff member, and first responder who cared for, comforted, and protected children from harm, often at risk to themselves. We will do everything in our power to assist and support the healing and recovery of Newtown." [Updated at 5:01 p.m. ET] Law enforcement officials are not prepared to identify the shooter right now, Connecticut State PoliceLt. J. Paul Vance said in a press conference. Vance said that they are working diligently at the crime scene as well as with the medical examiner to identify the victims. "We will leave no stone unturned," Vance added about the entire investigation. [Updated at 4:54 p.m. ET] We are now being told there was no body found in the Hoboken, New Jersey, home as had been previously reported. [Updated at 4:23 p.m. 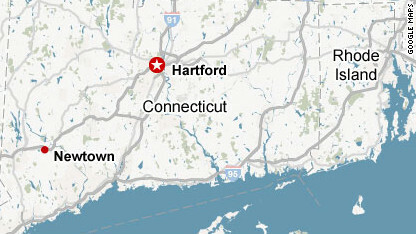 ET] We have learned that Connecticut police have searched the suspected gunman's home and place of employment in the wake of Friday's mass shooting, Connecticut State Police Lt. Paul Vance told CNN's Wolf Blitzer. They have also interviewed his friends, relatives and "everyone who possibly had any connection with him whatsoever," he said. [Updated at 4:11 p.m. ET] Police did not discharge their weapons at any time when responding at the school, police spokesman Lt. Paul Vance told CNN's Wolf Blitzer. However, he could not confirm whether the suspected shooter - who died at the scene - killed himself, saying that would have to be determined by the medical examiner. I just woke up in my hotel room in Beijing, China, to learn that another mass shooting has taken place - this time at the Sandy Hook Elementary School in Connecticut. My thoughts and prayers are with the families of the victims and the entire community of Newtown, CT. I just spoke to Gabby, and she sends her prayers from Tucson. As we mourn, we must sound a call for our leaders to stand up and do what is right. This time our response must consist of more than regret, sorrow, and condolence. The children of Sandy Hook Elementary School and all victims of gun violence deserve leaders who have the courage to participate in a meaningful discussion about our gun laws - and how they can be reformed and better enforced to prevent gun violence and death in America. This can no longer wait. [Updated at 3:56 p.m. ET] The principal killed was Dawn Hochsprung. 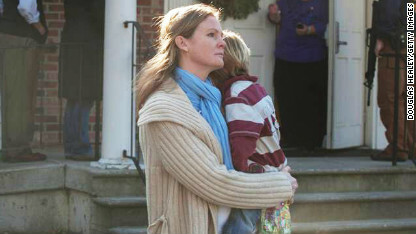 We received this photo via Newtown.Patch.com. [Updated at 3:54 p.m. ET] Three guns were found at the scene, CNN's Susan Candiotti reports. According to a law enforcement source, the third weapon found on the scene was a .223 Bushmaster. The other weapons, previously reported, are a Glock, and a Sig-Sauer. No word on the models of Glock or Sig-Sauer. [Updated at 3:51 p.m. ET] A federal law enforcement source tells CNN's John King the information from the scene is that the shooter arrived and headed directly toward and to his mother’s classroom. That and the other information now emerging - another family member killed, police interviews - lead them to believe his mother was the primary target. But they note he also came armed with clear intention of mass killing. [Updated at 3:45 p.m. ET] There were a total of 27 people dead at the school, Lt. Paul Vance of the Connecticut State Police said. Six adults, 20 children and the shooter were killed. Eighteen students were pronounced dead at the scene, and two others died at the hospital, said Lt. Paul Vance of the Connecticut State Police. The six adults died at the scene. [Updated at 3:43 p.m. 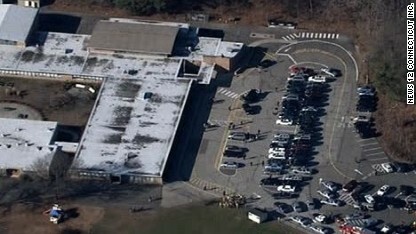 ET] Connecticut State Police Lt. Paul Vance has just said that the shooting took place in one section of the school and in two rooms. [Updated at 3:33 p.m. ET] Connecticut Gov. Dannel Malloy called the mass shooting "a tragedy of unspeakable terms." "Earlier today a tragedy of unspeakable terms played itself out in this community," Malloy said, adding that "you can never be prepared for this kind of incident. "A number of our citizens, beautiful children, had their life taken away from them as well as adults whose responsibility it was to educate and supervise those children," Malloy said. [Updated at 3:22 p.m. ET] It appears that another member of the alleged shooter's family is dead. A senior law enforcement official familiar with the investigation says a brother of the alleged shooter was found dead in a home searched in Hoboken, New Jersey. We already knew the suspect's mother was found dead in the elementary school. [Updated at 3:16 p.m. ET] From the president: "I offered Gov. Malloy my condolences on behalf of the nation." 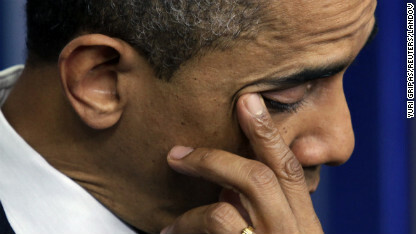 The president appears to be emotional, he's wiping his eye. "We've endured too many of these tragedies in the past few years. Each time I learn the news I react not as a president but as anybody else would as a parent. "That was especially true today. "I know there's not a parent in America that doesn't feel the same overwhelming grief that I do. "The majority of those who died today were children, beautiful little kids between the ages of 5 and 10 years old. "They had their entire lives ahead of them, birthdays, graduations, weddings, kids of their own. "Among the fallen were also teachers - men and women who devoted their lives to helping our children fulfill their dreams. Our hearts are broken today for the parents and grandparents, sisters and brothers of these children and the families of the adults we lost. "Our hearts are broken for the parents of the survivors as well, for as blessed as they are to have their children home tonight, they know that their children’s innocence has been torn away from them too early, and there are no words that will ease their pain. "As a country, we have been through this too many times. Whether it’s an elementary school in Newtown, or a shopping mall in Oregon, or a temple in Wisconsin, or a movie theater in Aurora, or a street corner in Chicago - these neighborhoods are our neighborhoods, and these children are our children. And we're going to have to come together and take meaningful action to prevent more tragedies like this, regardless of the politics. "This evening Michelle and I will do what every parent in America will do - hug our children a little tighter and tell them that we love them. "There are families in Connecticut that cannot do that tonight and they need all of us tonight. "May God bless the memory of the victims and in the words of scripture heal the brokenhearted and bind up their wounds." [Updated at 3:14 p.m. ET] The president will talk soon. You can watch him on our live stream here. [Updated at 3:12 p.m. ET] President Obama has ordered flags to be lowered to half-staff as a mark of respect for the victims “of the senseless acts of violence perpetrated on December 14, 2012, in Newtown, Connecticut,” according to a release from the White House. [Updated at 3:09 p.m. ET] The suspect's mother was shot and killed at the school, according to source close to the investigation. She was a teacher there. And we now know that Ryan Lanza, the suspected gunman, was 24. [Updated at 3:01 p.m. 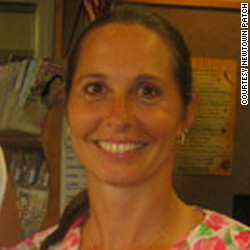 ET] The principal and guidance counselor at Sandy Hook Elementary School were both killed during the shooting, according to a witness that spoke to CNN. [Updated at 2:52 p.m. ET] We have just learned via a tweet from House Speaker John Boehner that flags at the U.S. Capitol will be lowered. [Updated at 2:47 p.m. ET] President Obama will make a statement on the tragedy at 3:15 p.m. ET. We'll have that live on CNN TV and right here. [Updated at 2:45 p.m. ET] Various locations are being used as staging areas around Newtown. This is outside the Newtown Methodist Church near the school where a woman is hugging a child. [Updated at 2:39 p.m. ET] Federal law enforcement officials have told CNN's John King that the shooting happened quickly and happened in a concentrated area. [Updated at 2:32 p.m. ET] Connecticut Gov. Malloy will be in Newtown and talk about the tragedy today at 3:30 p.m. ET. [Updated at 2:20 p.m. ET] We are now hearing from CNN's Mary Snow, who is reporting from outside the suspect's home, that dozens of law enforcement officials are on the scene. Neighbors are "shaken," Snow said. [Updated at 2:11 p.m. ET] CNN's Susan Candiotti has just reported that a law enforcement official tells her the suspect is named Ryan Lanza and he is in his 20s. [Updated at 2:09 p.m. ET] We're hearing even more devastating news out of Newtown, Connecticut. CNN's Susan Candiotti has been told that 18 to 20 of the dead are children. [Updated at 2:07 p.m. ET] CNN's Jessica Yellin is reporting that we're likely to hear from President Obama today on the school shooting, according to a senior administration official. We don't know when our where we may hear from President Obama. [Updated at 2:04 p.m. ET] Lisa Procaccini, the parent of an 8-year-old at the school, tells CNN that her daughter said school officials kept her calm during the shooting and told her the loud noise was hammering going on. Eventually police came in and let her daughter and her teacher leave the school building. "I'm even kind of numb about what's going on," she told CNN's Wolf Blitzer. "I'm in a state of shock. I don't know how Im going to handle having [my daughter] know ... about the whole situation." [Updated at 1:57 p.m. ET] The death toll is closer to 30 than 20, a federal law enforcement source in Washington told CNN's John King. Most of those killed are children, the source said. The source also said the suspected gunman, who is dead, had a connection to the school. He would not elaborate on that connection. The source is in touch with authorities on the scene. As a mother, I can only begin to imagine what the students, parents, teachers and staff of Sandy Hook Elementary must be experiencing. My thoughts and prayers go out to everyone impacted by this horrific tragedy. While details are still emerging, I hope for the safety and well being of the children, teachers and staff at Sandy Hook Elementary and for the Newtown community. [Updated at 1:51 p.m. ET] We have just learned that the suspected shooter is 20-years-old, a law enforcement source with knowledge of the investigation tells CNN’s Susan Candiotti. [Updated at 1:47 p.m. ET] A few more details from the White House press briefing earlier. White House spokesman Jay Carney said while today is not the day to debate gun policy, an assault weapons ban "does remain a commitment" of President Obama. [Updated at 1:45 p.m. ET] We are now learning that a male is being questioned by investigators, but he is not being called a suspect, CNN's Susan Candiotti reports. [Updated at 1:42 p.m. ET] Connecticut State Police Lt. Paul Vance said the shooter is dead inside the school. State police PIO Lt. Paul Vance: "The shooter is deceased inside the building." Vance said there are a number of fatalities that includes both children and adults. He did not add more details about how many people were killed during the school shooting. [Updated at 1:41 p.m. ET] Police have now begun their briefing on the shooting. [Updated at 1:32 p.m. ET] We're hearing more from the scene of the massacre through tweets and interviews. According to my sister, teachers @ Sandy Hook school handled situation incredibly well. [Updated at 1:23 p.m. ET] President Obama has spoken to FBI Director Robert Mueller and Connecticut Gov. Dan Malloy to get the latest information and express his condolences, White House spokesman Jay Carney said. [Updated at 1:21 p.m. ET] We're now hearing that it may be a while for the briefing from the police. [Updated at 1:17 p.m. ET] This was the scene from the air earlier, taken by News 12 Connecticut, with emergency vehicles in the school parking lot. [Updated at 1:09 p.m. ET] The police are set to give a news conference soon where we'll learn more. We'll bring that to you as soon as it starts. [Updated at 1:07 p.m. ET] Here's the chilling account told to CNN's Meredith Artley of what happened at the school. [Updated at 12:59 p.m. ET] Many people are talking again about gun control. But White House spokesman Jay Carney isn't joining in for now. "I think it's important on a day like today to view this as I know the president, as a father does and I as a father and others who are parents certainly do, which is to feel enormous sympathy for families that are affected and to do everything we can to support state and local law enforcement and support those who are enduring what appears to be a very tragic event. There is, I'm sure, will be, rather, a day for discussion of the usual Washington policy debates but I don't think today is that day. 9 y/o girl says that "police with big guns" led her classmates out of the building. Asked them to cover their eyes. [Updated at 12:48 p.m. ET] "Close to 20” people have been killed, including at least 10 children, a law enforcement source with knowledge of the investigation says. [Updated at 12:47 p.m. ET] President Barack Obama has been informed of the school shooting in Connecticut and will receive regular updates throughout the day, the White House said on Friday. [Updated at 12:27 p.m. ET] The mom who spoke to CNN's Meredith Artley said she heard "at least 100 rounds" being fired. The shooting began about 9:35 a.m., the parent said. There was a "pop pop pop" in the hall outside the room. Three people went out of the room into the hall where the sounds had come from. "Only one person came back," we were told. The witness told Artley that she then called 911. She said she never saw the shooter but she later was escorted outside the room past two bodies lying in blood. [Updated at 12:16 p.m. ET] Two adults were killed, according to a parent who was at the school during the incident, and who talked to our colleague Meredith Artley. "I am shocked and saddened by the horrific news from Sandy Hook Elementary School this morning, and I pray that kids, teachers, staff, and families reach safety as quickly as possible. While we don't have much information right now, our thoughts are with the victims and their loved ones." [Updated at 12:05 p.m. ET] The shooter's body is in a classroom, a source with knowledge of the investigation tells CNN’s Susan Candiotti. [Updated at 12:02 p.m. ET] Multiple local media are reporting there are fatalities. We're checking. [Updated at noon ET] News Times reporter Libor Jany reports that all Newtown schools are on lockdown. To date, three patients have been transported to Danbury Hospital from the scene. Out of abundance of caution and not because of any direct threat Danbury Hospital is under lockdown. This allows us simply to focus on the important work at hand. [Updated at 11:54 a.m. ET] Connecticut House Rep. John Frey has nieces and a nephew at the school and is tweeting updates. [Updated at 11:47 a.m. ET] The dad of a student at the school told CNN affiliate WTNH there were about 600 pupils in the building at the time of the shooting. [Updated at 11:45 a.m. ET] At least three people were wounded and are in "very serious" condition at a hospital in Danbury, Connecticut, that town's mayor, Mark Boughton told CNN. He couldn't say whether the victims were children. [Updated at 11:44 a.m. ET] Andrew Doba, Director of Communications with Connecticut Governor Malloy's office, says they are coordinating with local authorities and state police. They continue to monitor developments in Newtown. The governor is in Connecticut today. [Updated at 11:40 a.m. ET] We're getting live pictures from the scene from CNN affiliates. [Updated at 11:34 a.m. ET] The shooter is dead, a source with knowledge of the investigation, tells CNN’s Susan Candiotti. Police have recovered two weapons from him, the source added. It's not known whether police killed the alleged shooter or he took his own life. The source says one weapon recovered is a Glock and the other is a Sig Sauer. [Updated at 11:27 a.m. ET] The Hartford Courant, citing police, said an unspecified number of people had been shot. The nature of their injuries was unclear, the newspaper said. But it cited police in saying one person had "numerous gunshot wounds." [Updated at 11:19 a.m. ET] Affiliate WTNH says children are being taken to a nearby firehouse. [Updated at 11:10 a.m. ET] Details are still really sketchy, but we now have a photo from the Newtown Bee of children being led from the scene. [Updated at 11:03 a.m. ET] We're still getting details in of how many people may have been hurt. [Updated at 10:53 a.m. ET] Sandy Hook school is on lockdown and students are not being evacuated, a Newtown police spokesman tells us. [Posted at 10:30 a.m. ET] Breaking news coming in - Connecticut State Police are responding to reports of a shooting at a Newtown elementary school in southwestern Connecticut, according to police spokesman Lt. Paul Vance. We'll bring you more details as soon as we get them. Our affiliates in the area are saying the school is the Sandy Hook Elementary School. CT Now says injuries are being reported. Sad to think you send your children to school not knowing if they will come home today. We once outlawed alcohol in this country because it was deemed to be the cause of too much violence. So what happened? Organized crime seized the opportunity to make a fortune and people drank anyway. So let's say we outlaw guns with a new amendment, what possible repercussions could happen? People who want guns will still get guns and the people that have the guns will be the most powerful organizations in the country. It will be chaos. This tragedy and tragedies like it come down to societal values and family values, and this country's missing both. How pathetic that you cling to your "RIGHT" to own gun/guns. Please tell us all, what do you DO with your gun. Clean it? Polish it? Hold it in your hand and fantasize about shooting an intruder? If someone asked you to give up that gun and told you it would save one person's life, would you? Would you give up your weapon to save a persons life? What is more important to you? Have you ever used your gun for the self protection that you imagine you need it for? No.... It just makes you feel powerful to have it. I suspect you wouldn't give up your gun to save anyone, because you would have to return to being average and vulnerable like the rest of us. I am glad your cowboy fantasy is so important to you that our society has to suffer, that children have to die. I don't know how you look in the mirror. So the elementry school children should have been carrying guns? Typical NRA lunatic! He did not have to take all these lives of all of these people and their children away. What a loser. Time will never heal these wounds. Such Beautiful little wide eyed souls. God Bless us all today. Most unprofessional commentary I've seen on any news network yet - Dr. Drew. Unbelievable. Without knowing ANYTHING about the parents or family of the shooter, he's making sweeping statements about how parents often ignore signs of mental illness and he has been implying that such is likely the case in this situation. Ryan Lanza was 24 years old. Even if his mother desperately wanted him to get psychiatric care or medication, she has ZERO ability to force him to get help. How dare Dr. Drew point his finger at her without knowing anything of the situation. We all find this mass killing to be horrifying. But holy cow... a medical professional should know better than to make statements like this. Is Dr. Drew aware of how difficult it is to force an adult who is mentally ill to receive help? NEARLY IMPOSSIBLE until they do something that threatens themselves or others. Until that point... nothing can be done. He needs to start speaking like a professional or shut up. Cnn is not reporting the correct person, it was not Ryan, but his brother Adam. they need to be locked away where they can not harm others. If the only thing between a mass murderer and harmless psycho is a pill, then the harmlesl psycho needs to be locked away. That is how our "criminal justice" system needs to running. Not obbsessed with exacting revenge but with keeping the dangerous people of all walks away from the rest of us.But that desire to exact revenge keeps us from being able to keep the psychos locked away, as we can't exact revenge on a complete nut-job. Easy solution, stop exacting revenge – let God handle that part, but by all means lock them away where they can't get guns and they can't cause injury to anyone but themselves. Psalm 9: 17The wicked shall be turned into hell, and all the nations that forget God. Why didn't God help those children? was he too busy collecting money for his churches? It's terrible this crime with children. Was the shooter jealous of the attention his mother gave to the children in her class. I wonder. You can have all the gun control laws you feel you need and then only the law abiding people will be without guns. The criminal will still have their guns and we will be much less safe. Kathy, by reformed gun laws, people usually mean the automatic weapons. There is no need for some of these bigger automatic rifles. And cops. Gun laws don't apply to them. Do you forget? Cops? Don't Give Fame To Murderers. don't even give him the courtesy of uttering his name. As a Canadian who admires America ,please someone do something about your archaic gun laws,it doesnt work anymore in your violent society. I guess you didn't know that Canada has more per capita violent crime than the US. "WE" are the "violent" country. Seems ignorance is bliss. The flew kills 35,000 Americans every year, mostly young kids! Home school your kids, they will live longer! Wouldn't you give up your individual right to own a gun even if it saved one of these children's lives? I sincerely hope the answer is yes, for at least some of you. That is a farce of an argument. We would have to give up a lot more if it would save "just one" life. Today all of america cries for justice. The blood of our children has been spilled for the mistakes we couldn't resolve. We as a nation has fallen down into the depths of despair. We spend billions overseas to protect our nation yet we couldn't protect our children at home. We have been chained to the politics of this nation and its leaders. We the people of this nation must unite and make sure our voice be heard so that our children blood does not have to speak for us all... God bless us all. We must be strong so that our children will be. The world is watching us right now, we must not show them that we are a nation in fear of its own country. Just like 9/11 we cried for war yet years later we regretted every bit of it. We must unite and settle things not triumph to the lines of congress and ask for such petty things. We have voices. We have the power to change our country. Now is the time for change. so true!!! so sad!!! God Bless America we used to know.